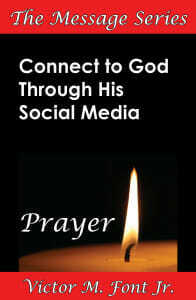 New eBook: Connect to God Through His Social Media—Prayer > Victor M. Font Jr.
You may embrace prayer with the utmost respect, yet at times you find that your own practice of it lacks purpose and vitality. You don’t spend time with God like you know you should and you don’t pray for things God would have you pray for. Connect to God Through His Social Media—Prayer is a wonderful message on prayer that teaches what the Bible has to say about the topic. Connect to God as never before using His vehicle for social media: Prayer. For a limited time, Connect to God Through His Social Media—Prayer is available exclusively from Amazon’s Kindle Store and Kindle Owners’ Lending Library. The Kindle Owners’ Lending Library is a collection of books that Amazon Prime members who own a Kindle can borrow once a month with no due dates. To celebrate the launch of this new eBook, I am giving it away from free for the next 5-days. That’s right, starting tomorrow November 22, 2013 and continuing through November 26, Connect to God Through His Social Media—Prayer is your to download absolutely free. When the free promotion ends, Connect to God Through His Social Media—Prayer will be available at its regular retail price of $2.99.